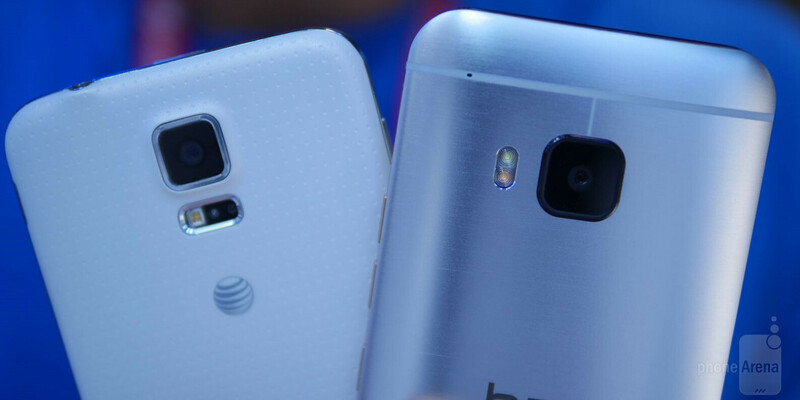 In this First Look edition we are pitting Samsung's finest for last year, the Galaxy S5, against HTC's flagship that just got announced, the One M9. At first blush, HTC's handset beats the S5 in everything - design, specs, speed and interface. The One M9 is beautifully crafted of a single aluminum chassis, while the dimpled back of the S5, while aiding a tighter grip, pales in comparison. Granted, you can remove the cover and swap the battery, but HTC placed a bigger unit in the One M9, so battery life shouldn't be a problem. The One M9 is notably thicker than the S5, which shows in your palm, but it is narrower and elongated, so a bit easier to handle with one palm only than Samsung's otherwise rather grippable phone. Given that both have about 5" displays (5.1" for the S5), they get filed in the category that is comparatively easy to use with one hand indeed. We like the home button on the S5, which quickly takes us to the main screen, though we aren't big fans of the built-in fingerprint sensor there, as it is not of the modern touch variety. The One M9 has onscreen navigation keys, and even smaller screen-to-body ratio than the S5, on account of the two large BoomSound stereo speakers with Dolby surround sound at the front. All in all, both handsets are not of the compact kind, relative to their screen size, but they offer extra features to account for it. In terms of chipsets and interface fluidity, the One M9 has the upper hand, bar none. Its screeching fast Snapdragon 810 trumps the 801 or Exynos in the Samsung, plus the new HTC Sense 7 UI is much lighter and more organized than Samsung's TouchWiz, even on Lollipop. The 20 MP camera on the back of the One M9 isn't performing better than the 16 MP shooter of the S5, as both are capable enough, though Samsung's Isocell technology sometimes wacks the color presentation more than it should. HTC offers 4K video recording, real-time HDR and all the works, plus we found the camera interface to be better organized. All in all, the One M9 is the better phone, but not by that much, unless you are a sucker for classy design, in which case the 30% or more price premium it commands will fit you like a glove on biker. These guys are nuts. Comparing this thing to that thing. First look, deep look, indepth look, long time review, camera comparison, processor comparison, DAMN. IM SICK OF ALL THESE RIDICULOUS COMPARISONS. WHY DONT YOU ADD A SEPARATE PAGE OR FOLDER OR SOMETHING LIKE THAT SO THAT ITS EASY FOR US TO SKIP THOSE.